The widely disseminated, relatively coarse nickel-iron alloy grains at the Baptiste and Sidney targets range in size from 50 microns to over 500 microns (or 0.05 to over 0.5 millimetres) and locally reach more than 1,000 microns. Rock samples from outcrop, taken at 50 to 200 meter intervals over a vertical relief of 600 meters, outlined the initial discovery shown in the plan and cross section. Based on the initial surface sampling, the Baptiste target measured approximately 1,750 metres long and from 800 to 1,300 metres in width. About 50% of this area was covered by overburden which masked the central portion of the target and southern boundary of mineralization. The Sidney target area is located 3 kilometres north of Baptiste on a broad ridge at approximately 600 metres higher elevation. The Sidney target currently measures 500 by 400 meters by surface mapping and is open to the northwest and southeast, where it is covered by overburden. A first-ever diamond drill program in 2010 demonstrated that both targets continue under the overburden. As shown in the map, the Baptiste and Sidney targets occur within a much broader area of finer grained nickel-iron alloy mineralization (<20 to 100 microns), based on visual results that have been confirmed by probe and scanning electron microscope data. The Baptiste and Sidney targets were first drilled in 2010, with nine core holes totaling 2,448 metres. The drill results, including seven holes in Baptiste and two holes in Sidney, were very encouraging, demonstrating consistent nickel-in-alloy values throughout the full length of all nine holes in the mineralized system. Each of the nine holes bottomed in mineralization. 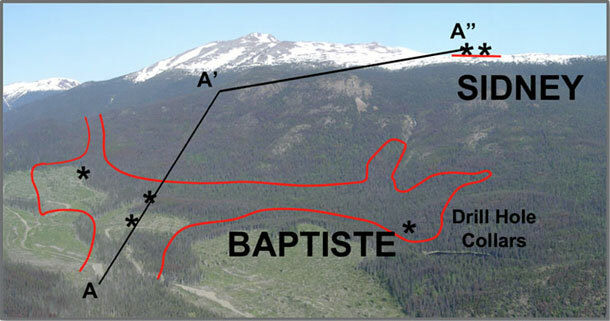 The holes in Baptiste were widely spaced over a distance of 1,600 metres and demonstrated the size potential of this zone. 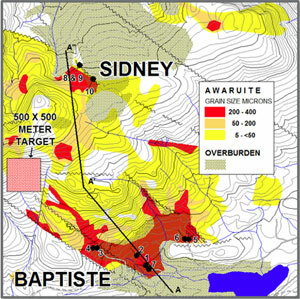 Assay results showed the nickel-iron alloy mineralization at Baptiste extended from the bedrock surface to a vertical depth of at least 230 metres. The Baptiste drill holes were inclined at a -50 degree angle. The two drill holes into Sidney were designed to test the target’s northeast margin or boundary. The holes were collared 325 metres apart outside the target area and aimed to the southwest at a -60 degree angle to intersect the inferred sub-vertical mineralized boundary at depth. The top portion of the holes intersected a non-mineralized sequence of volcanics, sediments and intrusions before encountering the Sidney target hosted ultramafics that continued to the bottom of the holes. The Sidney target returned 163 metres of 0.129% nickel-in-alloy in the lower half of hole 10SID-09 and 282 metres of 0.143% nickel-in-alloy in hole 10SID-10. The Decar Nickel District represents a potential new source for nickel. The naturally occurring nickel-iron alloy mineralization contains negligible sulpur, which eliminates a number of environmental issues typically associated with nickel sulphide deposits, such as acid rock mine-drainage. Furthermore, the lack of sulphur could offer some interesting benefits for the sale of the concentrate, which are being investigated. 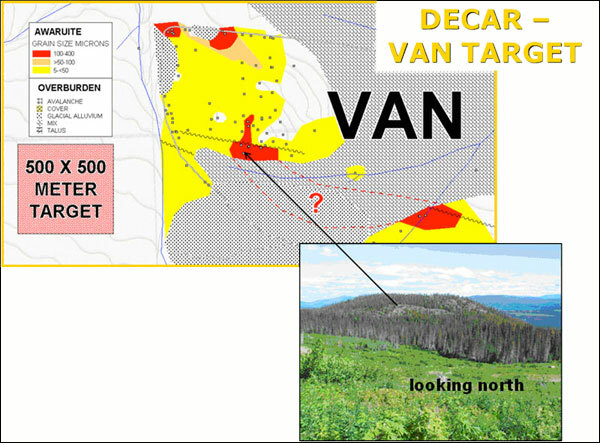 The Van target, located 3.3 kilometres north of Sidney, is currently defined by a sporadic distribution of coarse-grained nickel-iron alloy (100 to 400 microns) within a 1,750-by-600-metre area containing sparse outcrop. Initial mapping and surface sampling has outlined two areas of coarse-grained alloy mineralization that are located about 1,000 metres apart, with the intervening area covered by overburden. A well defined high total magnetic signature extends to several hundred metres based on inverted magnetic airborne data. Five rock sample sites returned nickel-in-alloy grades ranging from 0.11% to 0.14%. The north margin of this target area coincides with a west-northwest striking fault that has significantly brecciated and sheared the south face of Van Hill. A third, partially exposed zone of coarse-grained alloy mineralization is located in the north part of the Van area and is covered by overburden.